This is the fourth installment in our series on the 2015-17 budget process. 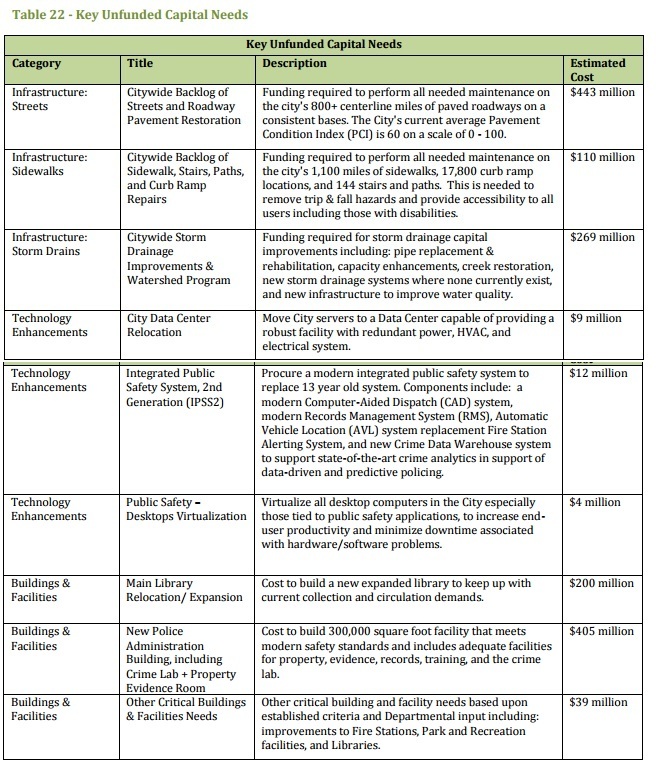 The mayor’s budget is scheduled to be released on Thursday, so between now and then, we’ll summarize some of the observations in the city’s recently published Five-Year Fiscal Forecast, which help set context for the budget decisions to be made over the next two months. In this post, we look briefly at the City’s severe deferred capital problem. Anyone who lives, works, drives, rides a bicycle or walks in Oakland knows something about our city’s deferred capital expenses. This problem is readily apparent from the horrible state of our streets and sidewalks. According to the Public Works Department, Oakland has 806 miles of streets and 1,120 miles of sidewalks. As the City acknowledges, the streets are on an 85 year resurfacing cycle, compared to the industry standard of 25 years. And (again, according to the City), 38% of the streets are in good condition, 38% fair, and 23% poor condition. But the issue of deferred capital expenses goes well beyond streets and sidewalks, and includes storm sewers, technological enhancements, buildings and facilities, including the Police Administration Building, which is in terrible condition. When then-Mayoral candidate Libby Schaaf was campaigning, she promised that if Measure BB passed, she would “bond against the new $8 million per year allocated to Oakland for road maintenance to make immediate upgrades in road conditions that will reduce maintenance costs going forward.” This is an important part of the plan for catching up. But there will undoubtedly have to be more. The next steps for the city government is to prioritize the above projects, determine which to move forward with most quickly, and develop a plan for doing that. Today’s Question: How do the mayoral candidates plan to meet Oakland’s public works needs? Fields believes “city government” has run Oakland into the ground. What We Found: Fields provides no details on how he plans to tackle local government corruption. What We Found: Harland’s response did not specifically address the question regarding public works. Kaplan said under her administration, Public Work maintenance repair orders would increase. “Engaging in repairs early in the cycle costs less than waiting for a road (or other public infrastructure) to get into worse condition,” she wrote. Kaplan, a former AC Transit board member, said she will aggressively seek outside funds for public works, and will work with agencies like AC Transit and the Metropolitan and County Transportation Commissions to identify funding for road repair in regional transportation funds. The councilmember said she agrees with many recommendations in a report issued last year on increasing the city’s general fund contributions to the Public Works Department. In addition, Kaplan said she will tap Alamada County vehicle registration fees, and will implement “coherent and effective maintenance and planning”. Kaplan’s office will also make sure the city’s redevelopment agency is budgeting adequately for infrastructure needs in connection with the plans. What We Found: Kaplan’s public transportation background shines through in her response to this question. The plan is detailed and ambitious. Nevertheless, she’ll have a bumpy road ahead. First, even with innovative cost measures, the city’s public works department is in a world of hurt. In a recent report, the department said it’s more than $400 million behind in repairing city streets. Second, Kaplan’s regional transportation agencies have their own challenges; MTC has been accused in the past by both AC Transit and others of focusing too much on rail, and less on supporting bus service. AC Transit meanwhile, is struggling with serious financial problems. Any new tax proposal for improving Oakland streets will have to garner significant support from residents who may feel overwhelmed with continuous tax proposals. Macleay said serious budget and strong oversight of the city’s hiring practices should be part of the discussion during the mayoral race. “The report on Hiring Practices should also be part of our discussions when electing our next mayor,” he wrote. Macleay said budget reform for the city needs to be developed before tackling public works. “I am not sure how we can deal with our infrastructure problem without a reform,” he wrote. “If we ever get to the point that we actually will put money aside during good times and spend it during downturns in the business cycle, then we could do this in spurts about every 10 years when unemployment is high. Macleay said stimulus funds and redevelopment funds could be used to improve public works. What We Found: Macleay’s response did not have an specific information on how he would improve the city’s public works program. Perata said because he believes the city currently has no plan in place to deal with Oakland’s crumbling streets, so that it’s hard to know the dimensions of the city’s infrastructure problem. It doesn’t help that there’s currently no director for the agency, Perata said. “I flatly do not believe public works cannot repair and maintain Oakland streets better than it has. The crew workers themselves have straightforward, best-practices solutions to improve performance with money now allocated,” Perata wrote. However, if he becomes mayor, Perata said he will put in place a variety of measures including having the city’s redevelopment agency pay for street, sidewalk, and storm water capital projects in redevelopment project areas; encouraging sponsors or partnerships for Public Works’ rehabilitation of its parks and landscaped areas; and tapping the sanitary sewer fund for certain operating expenditures by Engineering Design and Construction Department / CEDA. Perata said he is also supportive of innovative “green” technology that can address streets and infrastructure needs. What We Found: If Perata wants to use Oakland’s redevelopment agency to shore up streets and sidewalks, he’ll have to work hand-in-hand with city council on how to redirect the agency’s funds. That may be a challenge if the agency’s budget continues to stay thin. While Public Works seemingly has used some limited partnership programs in the past, the agency seems primed to develop more programs, perhaps with Alameda County’s public works program. As for redirecting the city’s sanitary sewer fund for other projects, Perata will have to go against city code which restricts such actions. Perata is joining a growing number of politicians calling for more green solutions in dealing with municipal public works. Quan acknowledges the challenges facing Public Works and noted that the City has already passed a sewer fee to comply with an EPA lawsuit. She also touched on the backlog in road repairs and the structural deficit in the Landscape and Lighting District, which she said has not received a cost of living increase since 1993. Quan called for a cost of living increase for park infrastructure, tree maintenance, and lighting costs; otherwise the department will continue to operate in deficit. “We should also consider construction impact fees to help our streets and hopefully pass Prop 22 this year so the state cannot take gas and vehicle license fees; that will stabilize our street repair funding,” she wrote. What We Found: Quan didn’t attach any numbers to her response—How much money may be needed for park infrastructure repair, for example. Quan also didn’t say what she will do as mayor if Prop 22 does not pass. Tuman said he believes maintenance, rehabilitation, or outright replacement of sewer lines should be a core priority for Oakland. Tuman said how much can be spent to do maintenance and repairs will depend heavily on what decisions are made about closing the deficit in January of 2011. What We Found: Tuman did a great job summarizing the MOBN! question, but he provided almost no details on what he would do to address the issue. What We Found: There were no details provided about ‘Friends of Candell’ or the candidate’s forthcoming ballot measure addressing public works issues.